The density of ocean water is determined by its salinity (or salt content) and temperature. The saltier and/or colder the water is, the denser it is. Salt water is most dense at its freezing point, unlike fresh water, which is most dense at about 3.9°C (39.0°F). Oceans are highly stratified: deep ocean water is heavy, and the lighter water is on top. This often is not the case in the atmosphere: warm air near the ground surface is lighter than the overlying air it displaces, resulting in unstable conditions and thunderstorms. Salty water freezes below 0°C (32°F): this is why salt is used to melt the snow or ice on a road pavement. The saltier the brine , the lower its freezing point. This is also why salt traditionally was added to the water–ice mixture used to make ice cream. Ocean water with a typical salinity of 35 parts per thousand freezes only at −1.8°C (28.9°F). So if there were no halocline in the polar oceans, then the cooled top ocean layer, being denser, would sink into the deep ocean, in the same way as thunderstorm clouds rise in the atmosphere, and the entire ocean column would have to cool to −1.8°C before its surface could freeze. Ice floes and other forms of sea ice are less salty than the sea water from which they formed, owing to a process known as brine rejection. Yet sea ice still is too salty to be melted for human consumption. Only icebergs, which are derived from glaciers, are composed of fresh-water ice. process of "deep-water formation" is an exception to the normally stratified nature of oceans. The salt enrichment is most effective when it occurs in a thin layer on a calm sea. 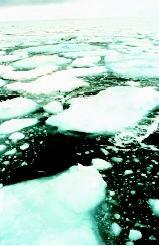 The faster sea ice is frozen, the less salt that can escape. For instance, when frozen at an air temperature of −40°C (−40°F), the salinity of the ice is about 10 percent. But when frozen at an air temperature of −6°C (21°F), the salinity of the ice is only about 4 percent. Such ice is fresh enough to use as drinking water; in fact, in spring, polar bears often drink the water in melting ponds on ice. When sea ice melts in the summer, the meltwater forms a relatively fresh surface layer that lies above the saltier ocean water, maintaining the halocline, and allowing easier freezing the next winter. SEE ALSO Brines, Natural ; Ice at Sea ; Ocean Chemical Processes ; Sea Water, Physics and Chemistry of. Thurman, Harold V. Essentials of Oceanography. Upper Saddle River, NJ: PrenticeHall, 1999. * See "Sea Water, Physics and Chemistry of" for a diagram illustrating a thermocline and a halocline. "For instance, when frozen at an air temperature of −40°C (−40°F), the salinity of the ice is about 10 percent. But when frozen at an air temperature of −6°C (21°F), the salinity of the ice is only about 4 percent." "10 percent" should read 10 parts per thousand. "4 percent" should read 4 parts per thousand. Little quistion. If i make a 10 million liter cube of sea water that is plus 5 degrees hot. And if i put the cube inside a freezer in minus 20 degrees. How long would it take to freeze all that.